Zaynah joined Westbrook in 2018. She qualified as a make-up artist in 2017, and is now training as an apprentice hairdresser. Whilst training with Westbrook, she is also attending college for NVQ Level 1 and 2 Hairdressing qualifications. 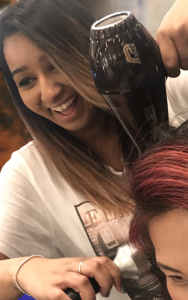 Zaynah would eventually like to become a fully trained hairdresser – which along with her make-up skills – will allow her to specialise in complete hair styling and make-up for bridal, or special events including parties/balls/proms and fashion and editorial work.